ZERO Fare! Only pay airport tax and fuel surcharge to Krabi! 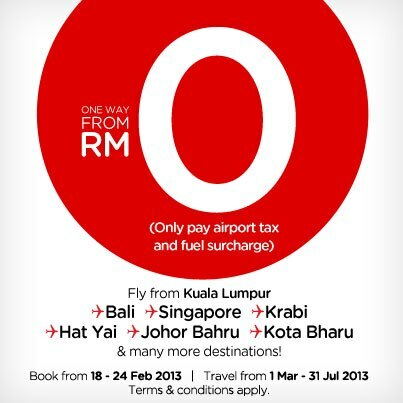 Beginning 18th February 2013 (Sunday) night @ 00:01 hours (GMT+8), AirAsia will be having ZERO fare to/from Krabi! Check out also flights departing from Kuala Lumpur International Airport (LCC Terminal), Kota Kinabalu International Airport (T2), Kuching International Airport, Main Terminal, Penang International Airport, Senai International Airport (Johor Bahru), and many more departure airports here.